Barbara's goal is to represent the USA at International venues such as the Pan Am Games, World Cup, World Equestrian Games and ultimately the Olympic Games. 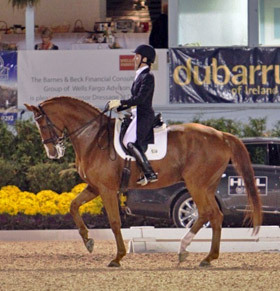 Barbara not only enjoys the challenge of competition but also sharing the sport and beauty of dressage with others. She also understands the team work it takes for this to happen. As with most high-level athletic endeavors, funding and sponsorship are of the utmost importance in order for a seasoned athlete to attain her goals. To accomplish these goals, Barbara must acquire the top Equine Athletes needed to qualify for these competitions and she must consistently train and campaign these athletes so that they are ready for the necessary qualifying competitions. Funding and sponsorship not only will help Barbara cover the financial expense of meeting these goals, but it will also allow her the mental focus needed to reach the highest level of her sport. Are you a business owner? Become a product sponsor. Contact Barbara directly to make a donation, or you can donate via Barbara's GoFundMe Account. $1 to $200 can help fund registration fees and membership dues for horse and rider, adequan or legend shots, one or two lessons/coaching sessions for horse/rider, rider fitness training and therapy. $200 - $500 can help fund a national show, fund one class at a CDI show, cover hotel costs for a weekend competition, cover one month farrier, chiropracter/acupuncture therapy or gastrogard, one series of adequan, or horse transport to a local show. $1000 - $1500 can help fund a CDI competition, one month apartment rental in Florida, one month of self-care board in Florida, clinic attendance for horse and rider, or horse transport to Florida. Make a tax deductible donation to the American Horse Trials Foundation. Barbara is eligible to receive donations from the ATHF, Inc. for reimbursement of showing expenses. Click here for more information. 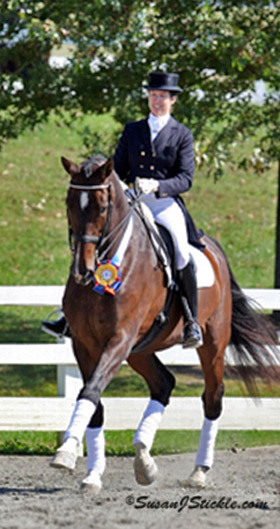 Barbara Strawson is a rider eligible for donations from the American Horse Trials Foundation, Inc. Donations are 100% tax deductible according to IRS Code Section 501(c)(3). The American Horse Trials Foundation was established in 1987 to assist 3-Day Event Riders and Organizers in raising tax deductible financial support for national and international competition. In 1996, the bylaws were revised so that the Foundation could assist riders competing in the related disciplines of dressage and show jumping. Barbara has recently established grant eligibility with the AHTF. By making a tax deductible contribution to the AHTF, you will be helping Barbara and her horses realize their potential. Stay informed on past and present fundraiser events and results. Many thanks to our team sponsors who have opened the doors to many possibilities on our journey to excellence. Working together as a team, we accomplish more than we ever thought possible. Kerrits™ Performance Equestrian Apparel: Ride On! Home-grown performance that sprouted in 1986, Kerrits™ Performance Equestrian Apparel thrives on creating innovative, functional and stylish performance apparel uniquely designed for women who love to ride—and their horses. Daily Dose Equine LLC: Healthy Food for the Same Price! Daily Dose equine is dedicated to providing high quality and nutritional products. They believe that the best outcome in health, performance and longevity are achieved when your horse or dog is getting the best nutrition. Barbara's training business is based at her facility, Misty Gleann, which is located at 12900 Lewisdale Road, in Clarksburg, MD 20871. Get directions to Misty Gleann.